Desiccant Packs for every-day needs. 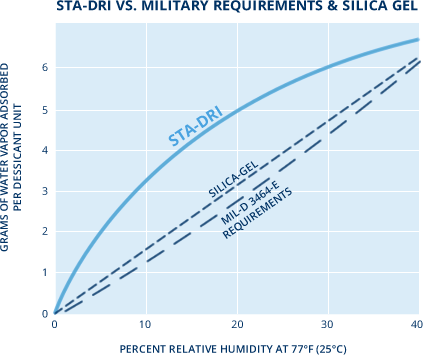 This graph shows pouches of Sta-Dri® desiccant packs moisture clay have superior moisture capacity versus other desiccant packs like silica gel. Sta-Dri® pouches’ drying ability exceeds Military Storage specifications*. Sta-Dri® is an easy, affordable way to maintain a dry environment for your valuables. Sta-Dri is safe to use around children and pets. No messy brine or charcoal – just safe, natural clay! Sta-Dri can be regenerated up to three times in a conventional oven or sunlight. Sta-Dri is non-corrosive and does not contain salt or brine. Desiccant unit which will absorb at least 25 grams of water vapor @ 20%RH and .70 @ 80%RH at 250 degrees F.
Beach Filter Products, Inc., located in Hanover, PA, offers over 65 years of service and quality, air filters, and hygroscopic reservoir/tank breather filters. Container Dri-It® is a trademark of Sud Chemie and used with permission. 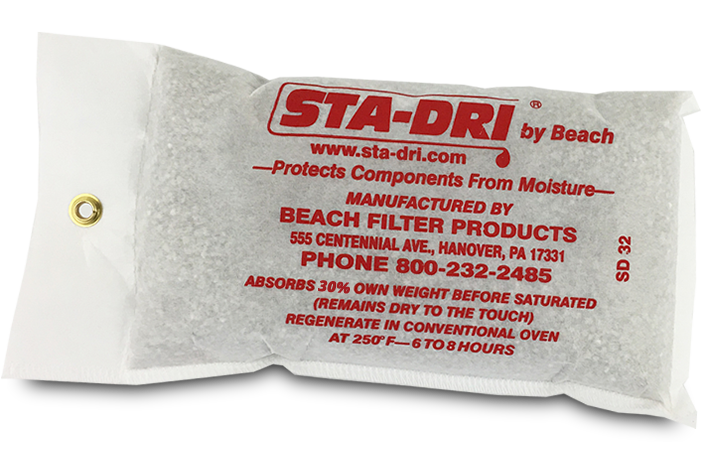 Sta-Dri® is registered trademark of Beach Filters, Inc.